"The Final Days of Superman" - Part IV: "Last Kiss"
After the 'rescue' from the DEO in National City, Clark and Kara are surprised by the arrival of Diana. Bruce had let slip Clark's news assuming that Clark and Diana had already discussed the situation. Sensing the heavy mood Kara makes an excuse to head back to National City and leaves the two former lovers to have a heart to heart. Diana refuses to accept the inevitable, offering to beg the gods to heal him, or to search for a cure but Clark stops her and explains this is a battle he cannot win. He has accepted his fate and knows the world will be safe in the hands of his friends, but Diana asks him a question that has had their relationship stunted for a while, ever since the Justice League shuttle to the sun... Clark answers with a passionate kiss. Two messages beep into the Fortress, one from Lois telling Clark A.R.G.U.S just took away a Superman impersonator that had arrived at the Daily Planet, then another from Steve Trevor asking Diana to come to the Stryker's Island facility. When they arrive they discover a being in a holding cell that looks remarkably like Superman glowing with energy that looks identical to the energy expended during Clark's Solar Flare bursts. Recalling its use, the time he used it with the most force was against Ulysses (during "The Men of Tomorrow" story arc) Clark, Diana and Steve try to identify the imposter but conventional methods don't work. They realize that there is a correlation between his energy and Ulysses, so Clark attempts to question his doppelgänger. 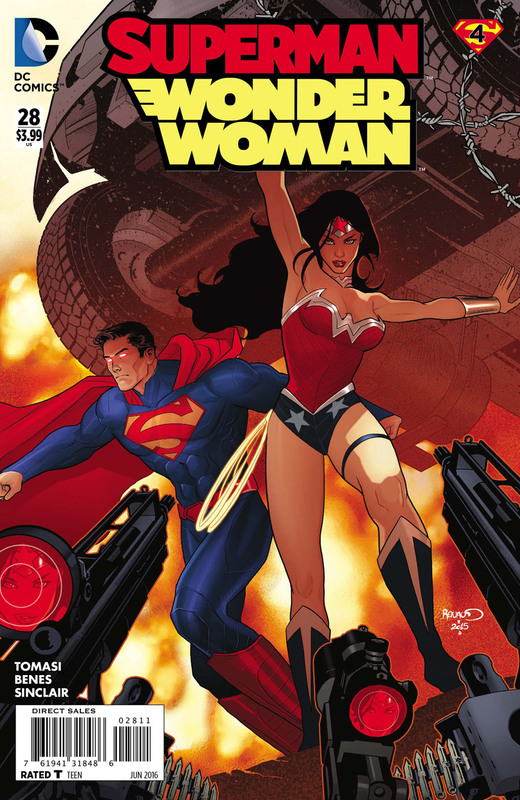 The energy being is angry and frustrated at being kept captive and seemingly shares Clark's memories, though driven by anger he attempts to break out to attack Superman and begs Diana to help, seeing her side with Clark as a betrayal of their love. With Steve and Diana watching over the doppelgänger, Clark goes to question Neil aka Ulysses, but his former 'brother' is less than friendly having spent every hour of every day in the prison. The doppelgänger meanwhile in a rage begins to burst with more and more power until he knocks back Diana and Steve shattering his cell wall causing a power failure in the process. As Diana fights off the essence of a betrayed lover, Superman in turn must face Ulysses who is no longer encumbered by energy siphons. The two fight in almost balletic synchronization with their foes but Diana is knocked back as the doppelgänger escapes through a tunnel and Neil realizes from his fight that Superman is no longer 'Super'. As an injured Steve reaches a console to restore power Diana arrives and instructs Neil to stand down. Story - 5: The more this story progresses the more I'm enjoying it, despite the inevitable outcome. Kara in her short scene seems a lot more human, more awkward, than before. Considering her angsty rage driven stories past, it's nice to see her being more than an angry teenager. Getting back to the story this meeting was a long time coming, Diana and Clark needed this moment for closure. Regardless of Clark's predicament, their break up was only based on 'I think' and it's nice to see it reach a much stronger climax. The kiss, so sad, was it a final kiss as the title suggested? I think so. There just seemed to be a finality to it. Many of us have endured break ups, maybe not with the impetus of impending death but we've all been there as the relationship ender or the broken hearted - almost poetic that Lois and Steve would interrupt the moment. The reintroduction of Ulysses was out of the blue but made sense to a degree as it was his storyline that introduced the writer's deus ex machina aka Solar Flare. If I had to be picky I would have liked Diana and Clark to have interacted more with the doppelgänger, his mystery and existence is far more compelling than revisiting "Men of Tomorrow". Still through the entire issue I come back to the powerful scene with Clark and Diana in the Fortress, it is one I will never forget. Considering how in a few short months Diana will meet a new Clark it makes me sad that she will see the face of a dead man on someone else. Art - 4: The art was spectacular with the exception of emotion, of facial expression. Diana spent most of the issue pouting, and considering the storyline I expected a furrowed brow, a quivering lip, a tear either from Diana or Clark but both seem to have overdone the botox. The only two that seemed to show physical emotion was the Superman imposter and Steve Trevor when he found a chunk of plexiglass in his leg. Having said that I mentioned the word balletic and it's true the art just flows with drama, energy and ease. Cover Art - 5: This cover is fantastic, it is so good it looks almost like an animation cel. Why didn't we have more of this early on? I sort of wish this book were out of continuity for more action and fun like this. I saw this as an ad months before and loved it though wanted to see it as a piece of artwork. It would be nice to see more of Paul Renaud in the future. Variant Cover Art - 2: A strange sort of Mad Max feel to this one especially with the color palette. 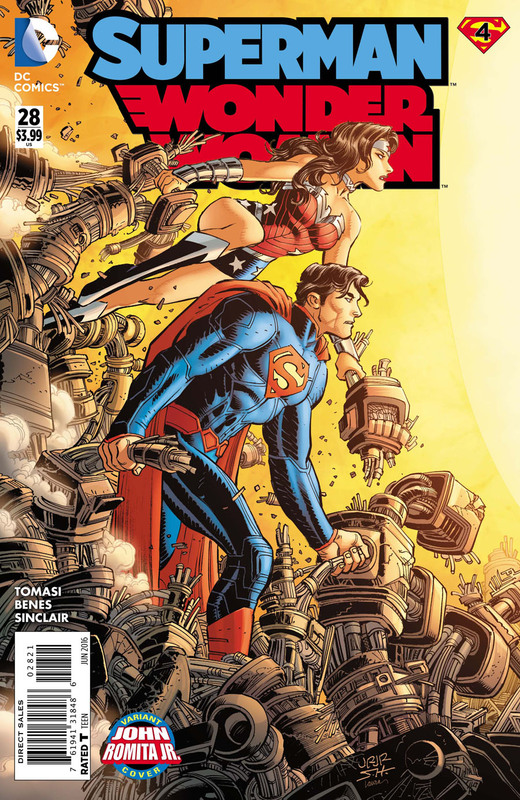 I'll be honest and admit I'm not sorry to see JRJr off the Superman books, evidence of why is this cover. He redesigned the armor but then we get this one again and it is piped with what almost looks like climbing rope strapped all over him. I think it is consistency that bugs me. It is nice to see Diana and Clark heading into battle, just odd that when looking at them I see Spider-man and Captain America heading into a fight. (No it isn't because I just saw Civil War! ).